In December 1998, "San Antonio Express-News" reporter Philip True vanished during a solo backcountry trek in western Mexico, home of the reclusive Huichol Indians and the Chapalagana, the Twisted Serpent Canyon, a 150-mile long gash that twists and plunges through the heart of the Sierra Madre. Five days later his editor, Robert Rivard, was part of a small search party that, nearly miraculously, tracked a trail of feathers that had leaked from True's sleeping bag to find his body. Trail of Feathers is the story of the search for True and of the quest to bring his killers to justice. It is also the story of another perplexing mystery: Why had True taken such a dangerous trip, into such a raw, uncivilized wilderness, alone and without sufficient safety preparations, in the first place? After an unhappy and unsettled youth, True was at the age of fifty finally settling down to a career and a wife he loved. His first child was about to be born. What was he running from, or to? Rivard's search for answers to these questions leads him deep into the Sierra Madre Occidental, one of Mexico's last true wildernesses, and deep into the secrets of Philip True's past. It also leads him into his own past, and an acknowledgment of the ways in which his life and True's mirrored each other. 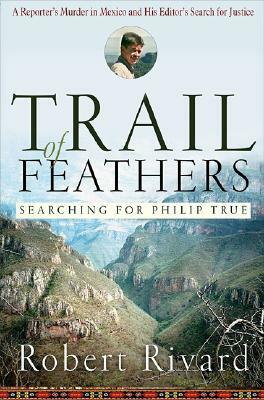 Suspenseful, atmospheric, and moving, Trail of Feathers is more than a true crime tale; it's a classic tragedy about how the past reverberates destructively into the present -- for individuals, for cultures, for nations.